ONE OF THE MOST IMPORTANT PIECES OF EQUIPMENT THAT ANY ELECTRICIAN WILL EVER PULL OUT OF THEIR TOOL BOX IS A PAIR OF GLOVES. Touching an electrical line—often believed by the worker to not be live, or to be insulated enough to not present a risk. Touching live equipment, such an energized electrical circuit. Guiding suspended loads via crane or other equipment as it makes contact with an electrical line. Touching equipment that has been damaged or improperly installed. Moving a piece of metal equipment, such as a ladder or scaffolding, and bringing it into contact with an electrical line. Almost every instance of electrical injury in these scenarios involves a worker’s hands conducting electricity passing through a line or piece of equipment. This is why having proper gloves is absolutely critical for every electrician. Oftentimes, electricians don't work on energized worksites, and don't need to worry about the risk of electrocution. But when you're working around hot electrical equipment, how do you make sure your gloves will protect you when you need it most? Electrical safety gloves are actually three gloves layered over one another, with each being made from a different material. The inner-most layer is a liner glove designed to keep your hands comfortable by absorbing sweat in the summer and holding heat in during the water. These are often made from cotton or a synthetic acrylic material. The outer-most layer is a leather protector glove that helps protect against cuts and tears. 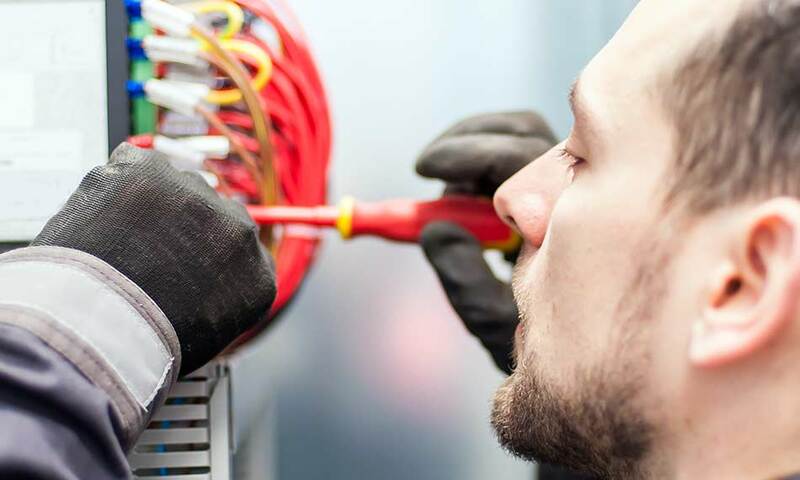 While some electricians don’t wear leather protectors, they are critical to protecting against wear and tear that can compromise the insulating capacity of your electrical gloves. If the leather protector is starting to tear or break down, it should be replaced immediately. Sandwiched between these two gloves is the rubber insulating glove, which is the layer that prevents electricity from being conducted into your body. There are two types of electrical safety gloves, Type I and Type II. Type I are non-resistant to the ozone, a gas commonly generated by high voltage electrical equipment. Exposure to ozone will crack and break down the rubber in Type I gloves, destroying their ability to resist electricity. Type I gloves are also vulnerable to UV rays. If you work near high voltage equipment, you should buy Type II gloves, which use rubber that is resistant to ozone and UV rays. Regardless of which type of glove you use, they should always be stored in a cool, dry place to protect against premature aging and hardening of the rubber. Be sure to choose gloves with the classification level appropriate for the voltages you typically work around. Many electrical workers have suffered severe electrical injuries despite wearing safety gloves. This is because electrical gloves won’t do you any good if you come in contact with voltages that are stronger than what the gloves were made for. Gloves may provide some protection much higher voltages than they are approved for, but always choose a glove with an approval rating appropriate to the voltages you work around. Taking care of your electrical gloves and checking them for damage will help to ensure your continued safety. Like anything else, electrical gloves break down over time. Check your rubber gloves for damage before every workday. If there are any cracks or tears, replace them immediately. Electricity can pass through a crack, or even a tiny pinhole. A good way to check for small holes is to inflate a glove with air and see if it leaks. Also, be sure to check for signs of melting, swelling, or other changes in the surface of your gloves. If you work around oil or other petroleum products, be aware that these will break down rubber—the first sign of this contamination is swelling, which will quickly lead to the rubber breaking down. When your gloves aren’t in use, store them in a cool, dry, dark place, away from tools or other items that can cause damage. As long as you choose the right gloves for the job and take care of them, your gloves will protect you and your livelihood as an electrician.